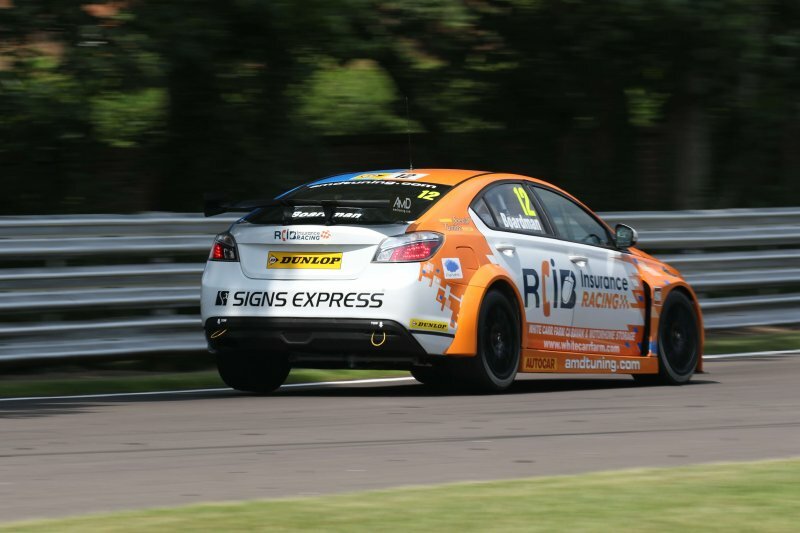 The AmD with AutoAid/RCIB Insurance Racing team picked up a double points score as the Dunlop MSA British Touring Car Championship headed for Oulton Park for the fourth round of the year. The West Thurrock-based team made the trip north feeling optimistic about pushing towards the top ten, with drivers Tom Boardman and Rory Butcher both targeting points in their MG6 GTs. At his home circuit, Lancashire racer Tom was left with work to do after qualifying, having posted the 30th best time despite being less than 1.5s down on the pace set by the pole man out front. A solid run in the opening race saw Tom make up six spots to finish in 24th spot although a more challenging race two saw him end up in 25th having been forced to complete a drive through penalty for being out of position at the start. Having avoided an accident at the start of race three, Tom fought his way into the top 20 within two laps and continued to push hard to lie on the fringes of the points. When Aiden Moffat ahead ran into problems on the final lap, Tom was able to pounce to take 15th place and his second points finish of the year. Fife-based team-mate Rory Butcher qualified 23rd in the sister car but found himself dropping to the back of the pack when the lights went out in race one after he bogged down at the start. Fighting back to 27th place at the finish, Rory then displayed the pace in his car in race two with a battling drive through to 14th spot – just a second and a half away from eighth in a huge midfield battle. With a car more than capable of pushing for the top ten, Rory headed into race three in confident mood but his race would end in a dramatic fashion when he was caught up in a multi-car accident at the start that forced him into immediate retirement. “We had a few issues in practice that left me on the back foot a bit after Saturday, but I feel we came back from it well and I’m continuing to get more comfortable in the car and getting it more to my liking. “I’m happy that we’ve ended the weekend with a points finish at my home race although I’m disappointed at the same time that we didn’t get more. Had it not been for a small mistake on my part ahead of race two, I’m sure we could have picked up a good result there and that would be left me better placed for race three. “It was one of those weekends for us but at the same time, there are a lot of positives to take away from it. Qualifying was tough and then we had the issue at the start of race one, but we showed strong pace from that point onwards and it showed we had taken a huge step forwards overnight. “I felt we had a really good chance of scoring a top ten finish in the final race but then we had the incident where three into one wouldn’t go and it was just unfortunate – the lightest of touches ended up in a huge smash. “We’ve taken a big step forwards with the MGs this weekend and I feel there are a lot of positives to take away from Oulton Park. For both drivers to have scored points is great and I think we would have been in a good position to score a top ten finish within the incident in race three. Excellent photography again accredited to Marc Waller!